Remembering Veenapani Festival is celebrated annually in memory of our founder, Late Veenapani Chawla. 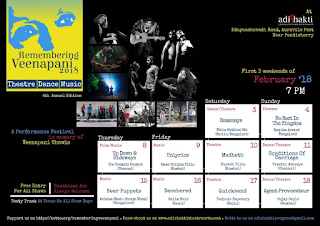 For this festival edition we have curated 9 shows spread across theatre, dance and music, on the first three weekends of February 2018. We celebrate this festival in memory of our dear guru and founder Veenapani Chawla. Veenapani, in her time encouraged performers of varied styles to show at Adishakti Theatre. She nurtured and provoked hybrid and pluralist ideas and performances. The Remembering Veenapani Festival is our attempt to keep alive the spirit of her work and deed. 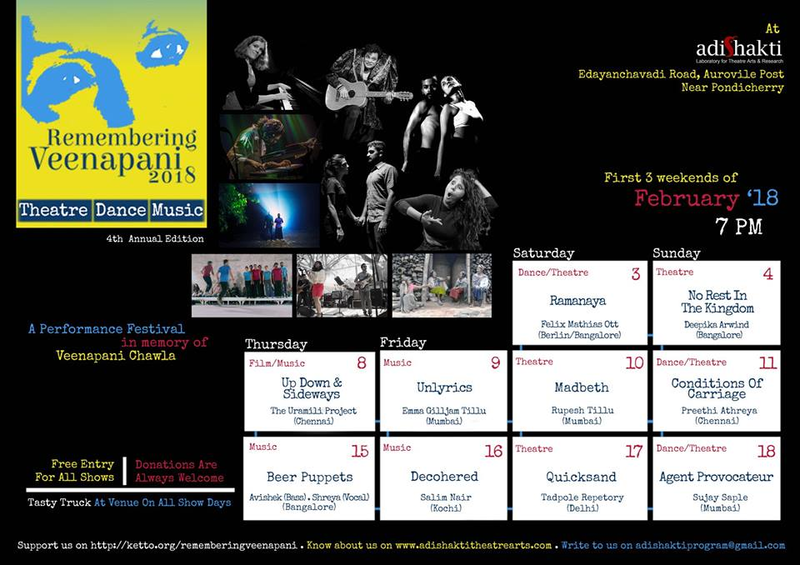 10 shows spread across the first three weeks of February at Adishakti, near Pondicherry. Free entry for all shows! !